(LILLOOET) The Mile 0 cairn was a fitting spot for the New Pathways to Gold Society (NPTGS) to begin the next phase of its journey down the Gold Rush/Spirits Trails. Thanks to new funding from the provincial government, NPTGS will be able to continue to create economic development opportunities via heritage tourism and First Nations reconciliation in the Hope-Barkerville corridor. “The Mile 0 cairn marks the beginning of the Cariboo Waggon Road that helped lay the foundations of modern British Columbia,” said Fraser-Nicola MLA Jackie Tegart. 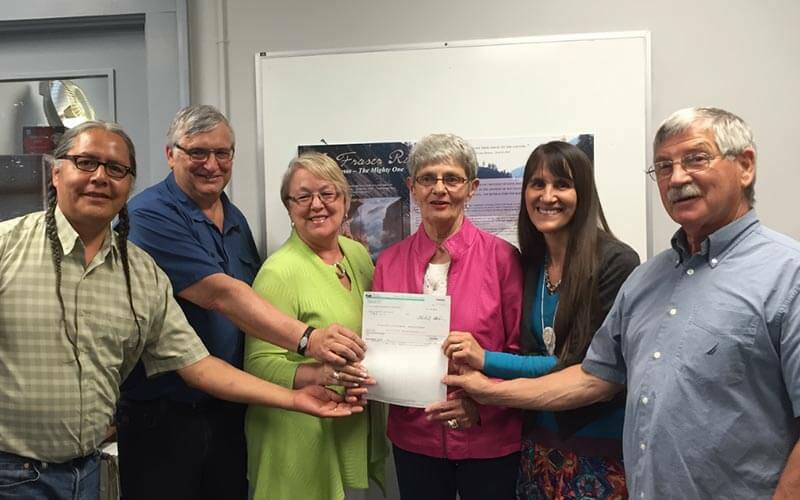 Tegart and Cariboo-Chilcotin MLA Donna Barnett presented the funds to NPTGS representatives at an event at the cairn in front of the Lillooet Museum and Visitor Centre on Friday afternoon. “NPTGS has had a tremendous track record of building partnerships with government and communities to create new heritage tourism assets and jobs since its inception in 2007,” said Barnett. NPTGS Co-chair Terry Raymond said the $500,000 in new funding will allow the Society to continue work on initiatives like the Alexandra Bridge Project, the Gold Rush All Seasons Trail and corridor marketing programs. “We still have a lot of work to do,” said Raymond, Fraser Valley Regional District Area A Director. “Partnering with First Nations has been a key factor in the Society’s success to date,” said Cheryl Chapman, NPTGS First Nations Co-chair.